Diabetes, also known as diabetes mellitus, involves an increase in blood sugar levels, which are often a result of inadequate insulin production. In a recent study conducted by the Centers for Disease Control and Prevention, over 100 million adults in the country are now living with diabetes or prediabetes. These people are prone to developing diabetes-related eye diseases that can impair their eyesight. In a separate study, more than 7.7 million of these people have diabetic retinopathy, one of the leading causes of blindness for adults. Doctors Wood and Thurmond, your eyeglasses and eye disease specialists, discuss how diabetes can impair your vision. The retina is a thin layer of tissue that lines the back of the eye on the inside. Its primary function is to receive light that the lens has focused, convert it into neural signals and send them to the brain for visual recognition. High blood sugar levels, however, can damage the blood vessels in the retina. These blood vessels will swell and leak, which prevents blood from passing through. In other cases, new blood vessels grow on the retina, but they don’t function as they should. These changes affect eyesight and even cause vision loss. People with this eye disease may experience blurred, fluctuating or even dark or empty areas in their vision. Floaters or dark spots in your vision are also clear signs of diabetic retinopathy. Get in touch with your eye doctor if you experience these symptoms. Adults with diabetic retinopathy are also prone to developing diabetic macular edema. This occurs when fluid accumulates in the macula due to damaged blood vessels. Treatment for this eye disease often involves laser procedures to stop the leakage in the macula. There’s no better way to prevent diabetes-related eye diseases than to maintain a healthy lifestyle and exercising regularly. Avoiding sweetened beverages, packaged snack foods and other sugary foods can also help prevent diabetes. 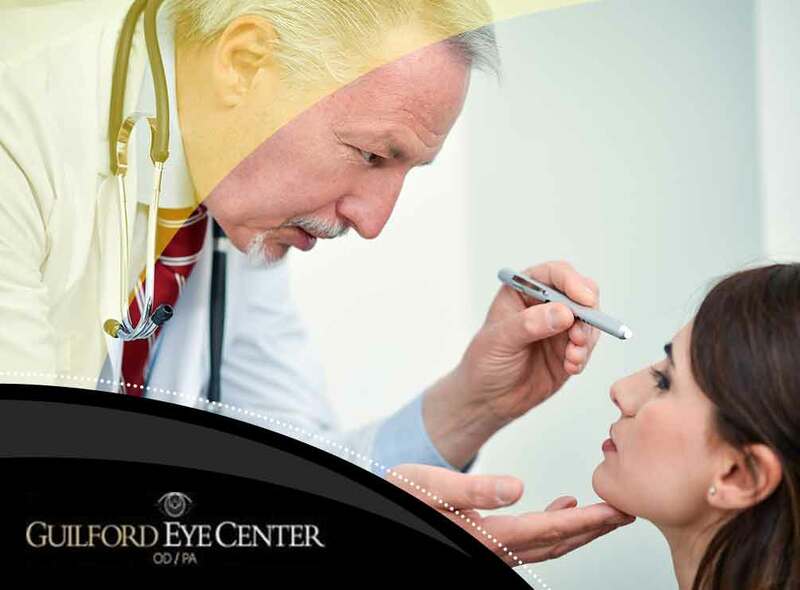 Count on Guilford Eye Center to help detect diabetes-related eye diseases through a comprehensive eye exam. Call us today at (336) 387-6777, or fill out our online form to schedule an appointment. We serve residents of Greensboro, NC.